Joining the family of Krakow’s most successful pub, Alchemia, and Krakow’s most successful café, Bunkier Sztuki, Alchemia od Kuchni is a new restaurant with big shoes to fill. Situated just around the corner from Alchemia’s main entrance on pl. Nowy, Alchemia od Kuchni is integrated, but a little separate, from Krakow’s favourite Kazimierz drinking den. The restaurant has its own entrance on ul. Estery, but you can also get to it through Alchemia. The food also makes the trip from one to the other, as you can now order anything on Alchemia od Kuchni’s menu and have it brought to your table in the pub. Alchemia od Kuchni’s own dining room has a more restrained, more mature decor than the vampire movie set dressings that clutter Alchemia. It also has a beautiful picture window that allows diners to see and be seen on what is still probably the hippest corner in Poland. The one concession to Alchemia’s retro style is a mounted deer’s head. He’s called Eddy and, so the manager swears, met his end in a road accident, not as the victim of a hunter’s bullet. When I visited at the end of May, the restaurant had been open for less than a week and was still very much at the settling-in stage. Despite the lingering smell of fresh paint, the interior felt settled and calm, and the combination of rough brick walls and ultra-cool white tilling manages to strike a nice balance between relaxed and refined. 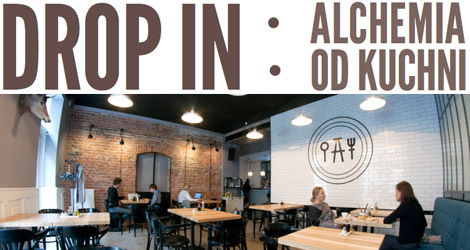 Co-managers Kuba Ignaszak and Małgosia Kyrcz are young and bursting with ideas to make Alchemia od Kuchni stand out in Krakow’s crowded dining scene. The menu has the stripped-down feel of an experimental poem, listing just 22 items and featuring dishes as diverse as halloumi burgers, grilled watermelon and chicken satay, all priced at around 25 złoty. Expect these to change frequently. Kuba was also keen to point out that they use only mint-fresh produce and make their own pasta. 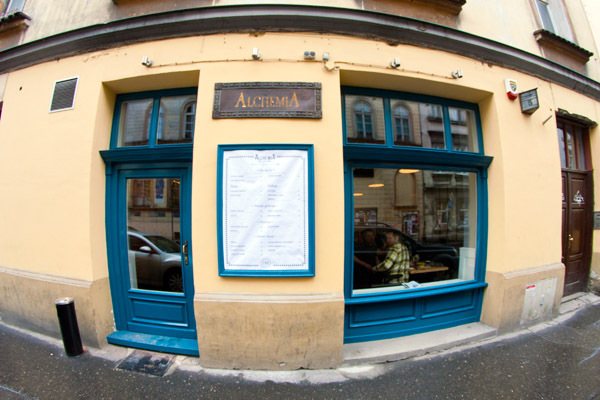 One of Alchemia od Kuchni’s big ideas is to offer what they call ‘street food’ – classic snack foods from around the world that can be bought to take away or eat in the restaurant. The current list includes veggie samosas, patatas bravas, stuffed tortillas and cod and squid in utterly delicious batter. The restaurant will serve only the items in the street food section of the menu from 10pm until late, but they are available all day too. They make perfect after-beer snacks, and are certainly worth trying instead of the ubiquitous zapiekanka. There is also a separate breakfast menu. I tried the ‘Indian curry,’ the chicken satay, the brownie with pistachio ice cream and the aforementioned squid and cod. 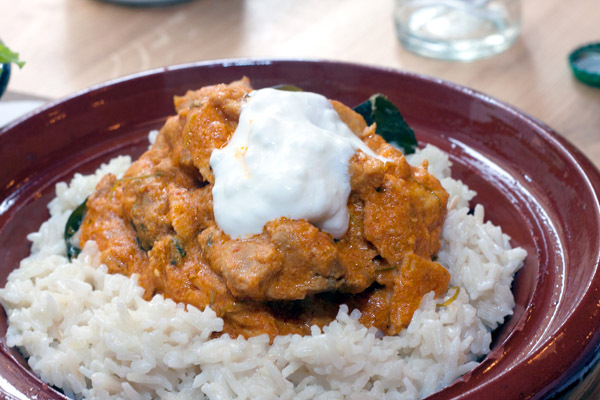 The battered seafood and the chocolate brownie appear to have arrived in the world complete and perfectly formed, but the curry and the satay have not yet reached maturity – though the flavours were genuinely excellent, the dishes didn’t quite come together. This is not surprising in a brand new restaurant and all the signs are that the menu will fulfil its promise. During our chat over lunch, Kuba mentioned several other ideas that are not yet ready to be revealed. These include an intriguing plan for customised meals based on customers’ answers to a series of questions about their mood. Whatever comes of these ideas, I confidently predict that we are going to see some new and interesting things from Alchemia od Kuchni in the coming months. Ordered for a small pizza and waited for 45 min. Then it turned out that there is no pizza. Just lost time there nobody cared. I think that Alchemia is used to be a good place.